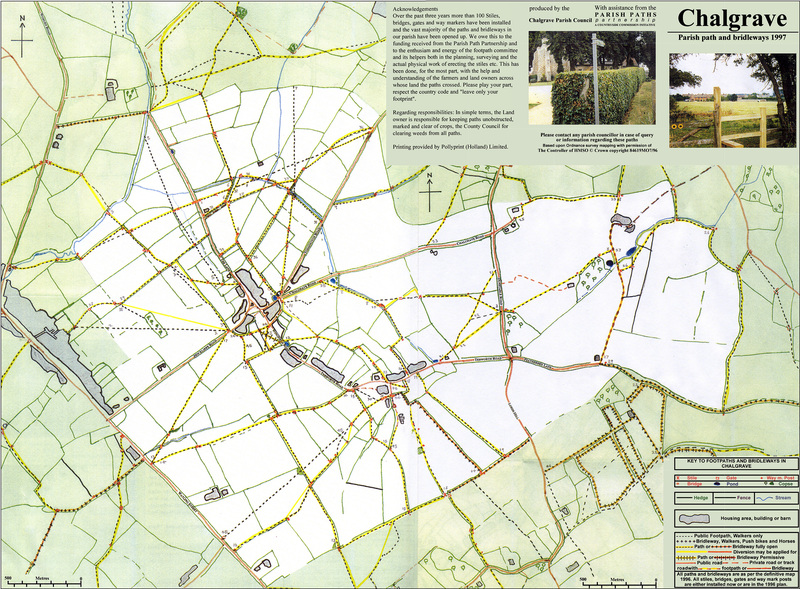 There are 38 designated footpaths and 1 bridleway in Chalgrave, totalling around 24 miles of paths. This does include a couple of paths that are on our boundary, but technically outside of the parish. The Rights of Way committee monitor and assist in keeping the paths in good order, and where necessary liaise with the Rights of Way officer from Central Beds Council. If you find any rights of way problems (paths blocked or unclear, broken stiles or gates, etc) or any other or suggestions for improvements, then please let the committee know. You can download a copy of our footpaths map. You can see from the acknowledgements that it was published in 1997 and followed three years during which virtually all the paths were brought up to a usable state. We are more than a decade on from when we started this improvement and during that time the paths have been regularly maintained by the footpaths committee and the County through the Parish Paths Partnership. If you are interested in helping please contact us. An 8 mile circular walk through Tebworth, Wingfield, and Chalgrave. Each year, on Rogation Day (the sixth Sunday after Easter), we “Beat the Bounds” of Chalgrave. It is the only day of the year that we are legally entitled to walk those parts of the boundary that are not a public right of way. More information. Todington Countryside have a number of walks around Toddington including the Chalgrave Heritage Trail. Walk4Life have a number of local walks. Let’s Go! provides all the information you will need to get the most from a trip into Bedfordshire, including a number of featured walks. Please respect the landowners rights by keeping to the marked rights of way and following the Countryside Code. The nearest open access land (otherwise known as ‘right to roam’) to Chalgrave is at Sundon Quarry which is a fascinating former quarry to explore (beware of steep drops). The footpath map is beyond useless….impossible to work out routes! Thank you for your comment. I’m very sorry you feel like that. It has been very well received since it was first published 20 years ago. You can use the latest ordinance survey map as an alternative but the scale is smaller. We try to ensure all routes are waymarked to assist walkers. The only changes are recent diversions due to the new road. If you would like to identify your particular difficulty I will try to help.